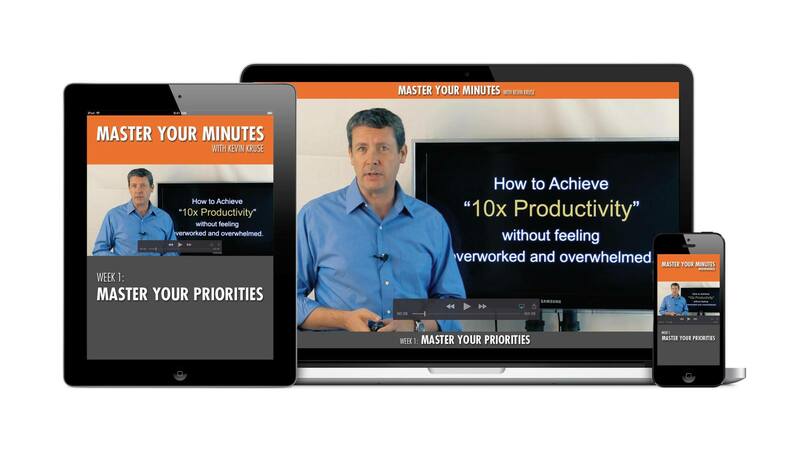 Master Your Minutes is a life-changing time management and productivity training program designed by New York Timesbestselling author Kevin Kruse. It’s based on the world’s largest study of ultra-productive people—survey research on 4,000+ executives and qualitative interviews with 200+ self-made millionaires, CEOs, high tech entrepreneurs and even Olympic athletes. Kevin Kruse is the founder and CEO of The Kruse Group, and previously started several other multimillion dollar companies that won Inc 500 and Best Place to Work awards. Kevin is also a New York Times, Wall Street Journal and USA Today bestselling author of several books and is also a contributor to Forbes and Huffington Post. As a keynote speaker and executive coach Kevin has taught leadership and the Master Your Minutes system to Fortune 500 executive teams, non-profit leaders, and even to generals in the US Marine Corps. This program is the result of research into thousands of working professionals and interviews with hundreds of highly successful people. You are going to get 5 video training modules personally taught by Kevin Kruse, who personally uses the system in his own life. • Assessment: How Severe Is Your Procrastination? You can literally hit the play button on the very first video just 2-3 minutes from now. You’ll also get beautifully designed ready-to-print templates, worksheets and reminder cards so you can increase your productivity immediately.